You may have noticed – and I’m sure I’ve said it before – but my default midweek dinner starts with pasta. Any time I can’t think what to make… my eyes just wander on up to the jars of pasta on the shelf. I can’t help myself! So I bought myself this skillet / shallow casserole dish type thing. It can go on the hob / stovetop or in the oven. I felt like it was the sort of cookware that would inspire me to just throw together a bunch of yummy grains and veggies and cheese and whatever else I had to hand and bake it into a hearty casserole. It’s that kind of effortless cookware where everything always comes out delicious. And so far, so good on that front! It may have to do with my eternal stash of yummy ingredients that I buy but can’t ever seem to keep up with! This gives me an easy way to clean out the fridge. 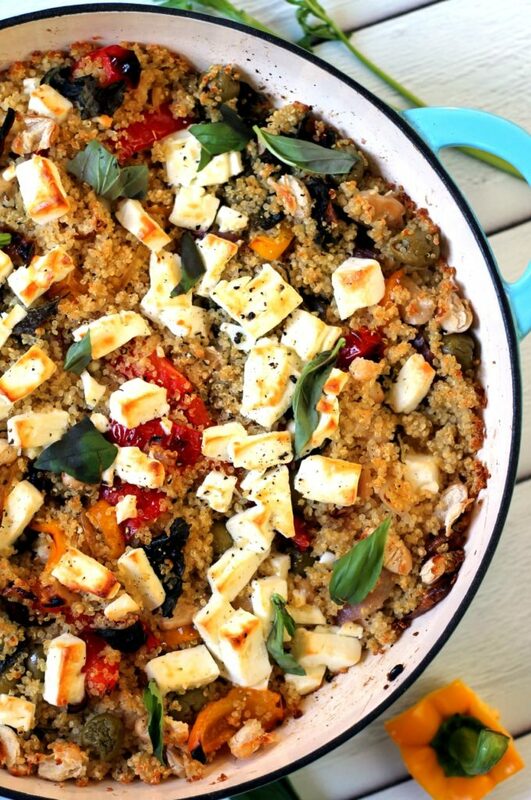 So today’s quinoa bake combines a bunch of Mediterranean flavors. 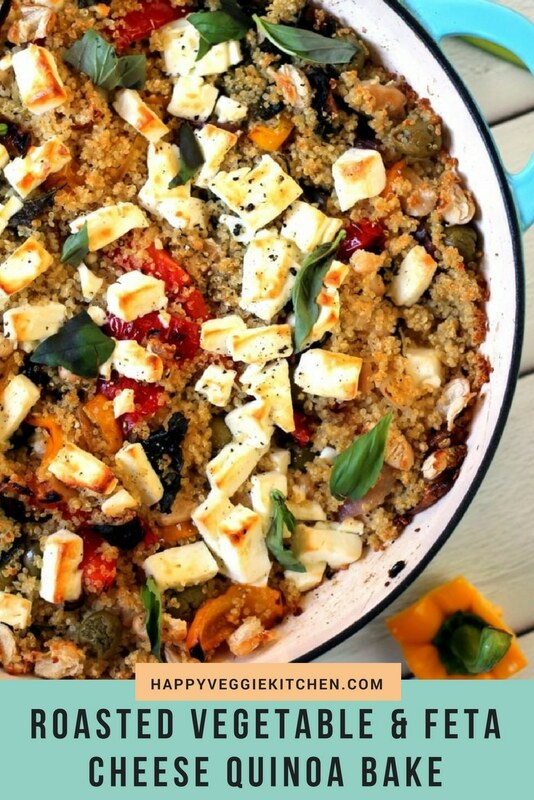 Roasted peppers and red onion, white beans, olives, lemon, basil… and melty feta cheese! 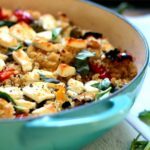 Casserole style, with the texture and bulk of quinoa to fill you up, and the melty richness of feta cheese to make it really special. I used to think I didn’t like quinoa. Despite it being brilliant, some quinoa recipes are a little too clean for me. The addition of all the flavors (especially the feta cheese) in this bake makes this dish truly exciting. 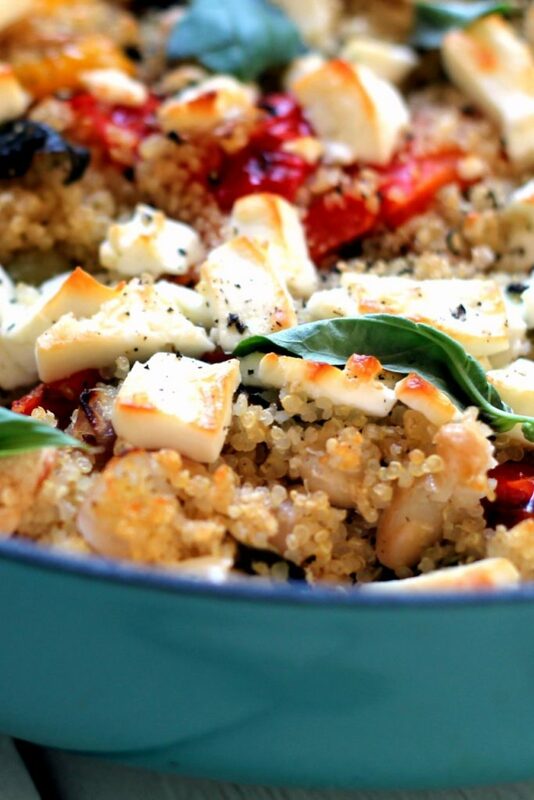 This quinoa bake could cure the quinoa skeptic in your life too! This is a super flexible recipe! Add whatever fresh, seasonal vegetables you have to hand! In the summer, add some zucchini and some cherry tomatoes. In the fall and winter, try using a mix of squashes and root vegetables (you may need to roast them a little longer before adding the quinoa). Any Questions about this Quinoa Casserole? Can I freeze this quinoa casserole? Yes! You can freeze it for up to 6 months. 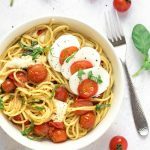 What can I use instead of feta cheese? If you need to swap feta, try goat cheese or halloumi. Can I make a vegan version of this quinoa bake? Yes! You could make this dish vegan by using a tofu feta. 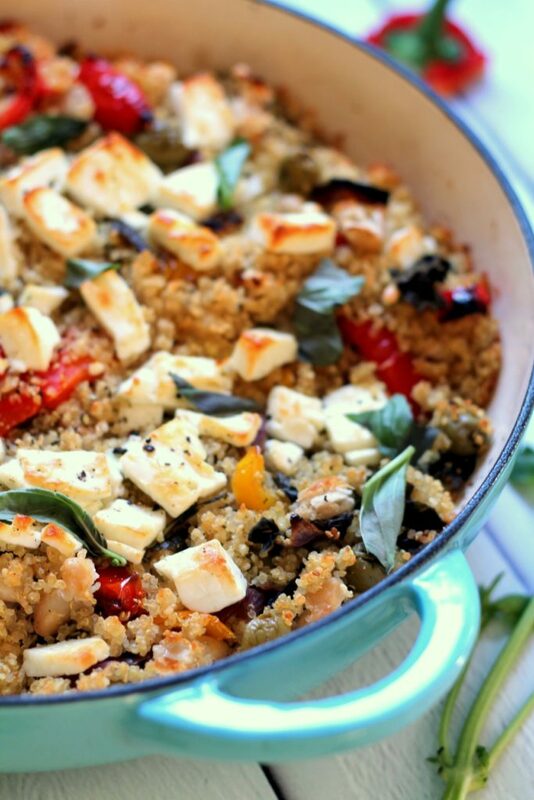 Check out this tofu feta recipe on Green Evi. What can I use instead of quinoa? Try giant couscous (aka pearl couscous), barley, or freekeh. 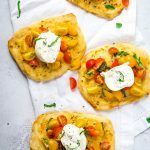 Love vegetarian feta cheese recipes? 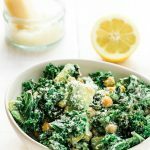 Here are some more feta cheese recipes from Happy Veggie Kitchen, as well as some picks from around the web. 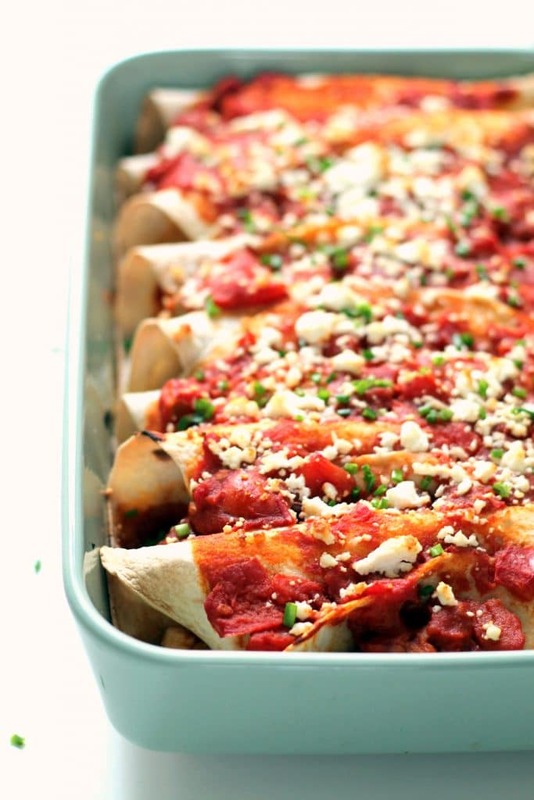 Try my Feta Cheese & Sweet Potato Enchiladas for a crowd pleasing vegetarian dinner. Need a great appetizer? 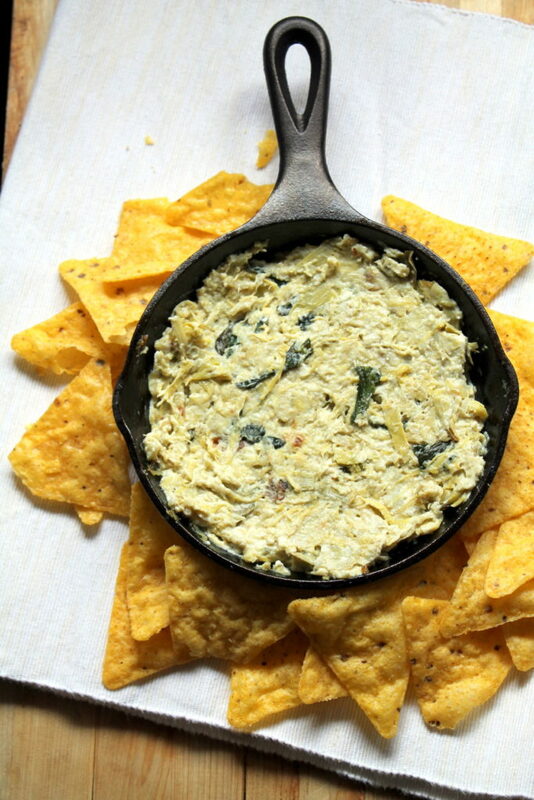 I have an easy peasy Feta & Artichoke Dip Recipe for your consideration. 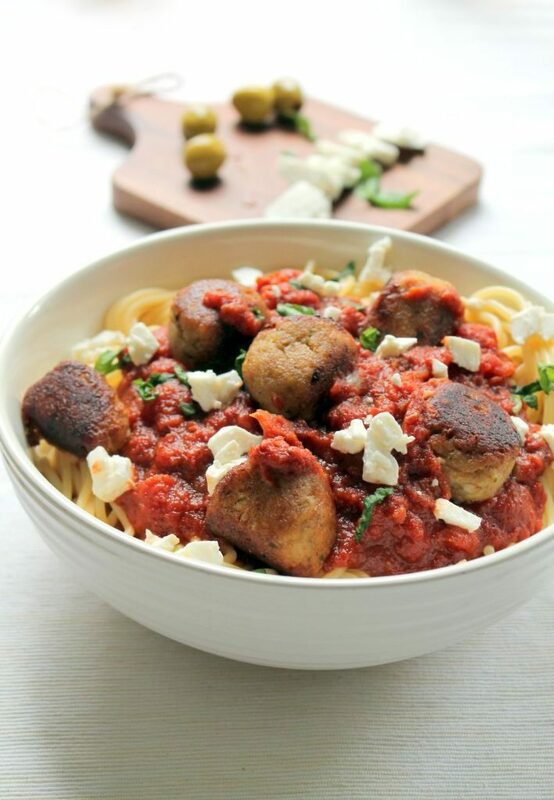 Try my Feta & Eggplant Vegetarian Meatballs over spaghetti for a delicious comfort food dinner. There’s some epic looking Feta Stuffed Grilled Plum Tomatoes over at Sustainable Cooks. In the summer, you should definitely try these Watermelon Feta Skewers from Salt & Baker. I love the look of these spinach and feta packed Greek Quesadillas from Scrummy Lane. An array of Mediterranean flavors and feta cheese are baked into this hearty quinoa casserole. It’s an easy to make vegetarian dinner and works as a main dish or a side. Healthy and fresh, with just the right about of indulgence from the feta cheese, this is a vegetarian recipe for everyone. Coat the bottom of a large skillet or shallow casserole dish with olive oil. Add the onion and peppers, and mix to coat with the oil. Add salt and pepper to taste. Place in the oven for 25-30 minutes, until roasted. Once the peppers and onion are roasted, remove from the oven and add the quinoa, cannelini beans, olives, lemon juice and torn basil. Grind in some extra salt and pepper if you like. Finally, add the cubed feta. You can either mix it through, add it on top, or a bit of both. Replace in the oven and bake for another 20 minutes, until the feta is warm and a little melty. Grill on high heat for a few minutes to brown the feta, if desired. could you make this in a slow cooker ? Hi! I think it could work. 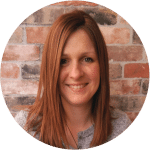 You could roast the vegetables in the slow cooker in some oil for 1-2 hours on high, then grease the sides of the slow cooker dish and add the other bits – leave it on low for 1-2 hours but check on it a couple times to make sure it’s not sticking? Hi, I see olives are mentioned twice in the list of ingredients but the 2nd mention doesn’t include type or quantity. Can you clarify? DOH! The second mention of olives was in error – just 1 cup of olives is needed. Sorry for the confusion and thanks for pointing it out, I’ve fixed it now. 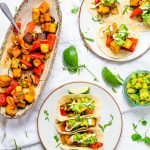 Made this for dinner last night- I am trying to slowly get into more vegetarian dishes as alternatives for our meals – This was excellent and my husband and I both loved it. The kids won’t touch it but they don’t eat much outside their comfort zone at their ages (3 & 6) …. plenty for leftovers dinner tonight- HOORAY! 🙂 Going to check out some of your other recipes as well. thanks! Yum. This was delicious and just the thing to cook for my non-vegetarian friends when they come over for dinner. They don’t even notice there’s no meat! Yummy! All of my favorites in one bake! Can’t wait to try this one, thank you! I’m assuming the cannellini beans should be drained & rinsed? Oh, yes! I will go in and clarify the instructions. Thanks for pointing that out! Can you reheat from frozen? Yes it reheats just fine in the microwave! Do you have to cover the veggies in the oven as they’re roasting? Nope, just leave them uncovered! Enjoy!